Think China's new "proactive" fiscal policy shigt will be sufficient to kick start the local economy, and boost global GDP? Think again. In the latest analysis from Vertical Group's Gordon Johnson, the strategist writes "that China's proactive fiscal policy pledge could fall short as servicing its existing credit stock absorbs an increasing share of GDP." As a reminder, last week, China’s State Council said it will adopt a proactive fiscal policy, outlining ways to fund ¥1.4tn in bonds to local government for infrastructure & provide ¥1.1tn in tax cuts, among other actions (e.g., R&D tax credits), all while urging no broad-based stimulus. In Johnson's view, this is a narrative that is rather reminiscent of ‘14, when the gov’t unleashed a wave of “micro-stimulus” measures after a string of weak data points (i.e., 5 mos. of contracting real estate investment). Yet, as he notes, the most recent PBoC mini-stimulus is much smaller than ‘14, while key restrictions remain in place for real estate/shadow loans (historically growth-driving conduits), compounded by the law of diminishing returns, suggesting a smaller boost from a much larger base this time around. Moreover, China’s total credit stock is markedly higher now than in ’14, implying more of every yuan in stimulus is going to service outstanding debt. How much? That may well be the critical question to gauge the flow through from any new fiscal policy. While China exited ’17 with an est. 266% of total credit to GDP, some economists put that ratio at >300% today. On trailing 12-mo. nominal GDP of ¥86.5tn, as of 2Q, this equates to >¥259.5tn in credit, which, assuming an avg. 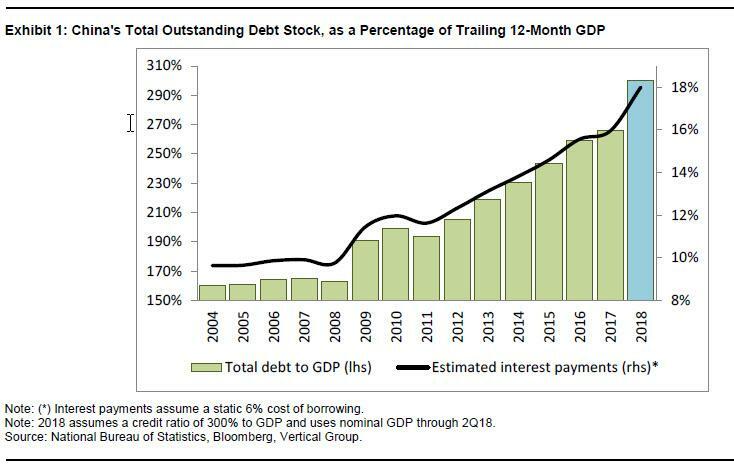 borrowing cost of 6%, means China’s annual debt service is ~¥14.3tn, or 18.0% of GDP – sensitizing interest & credit-to-GDP, to a respective range of 4-7% & 285-320%, puts China’s debt service at 14-22% of GDP. Indeed, China may stimulate more, as it did in ’15-’17, but, as of yet, it is doing far less than in ’14, as an increasing amount of “growth” is required to feed existing debt. If this analysis is accurate, China will have a far more difficult time not only stimulating its domestic economy this time compared to 2014, but in offshoring the favorable inflationary externalities from its latest expansion. In short: the world's growth dynamo may be getting choked up with debt, which means that in the next global crisis, China will no longer be able to step in and kickstart global growth. And with central banks running out of securities to monetize, just who will arrest the next recession?